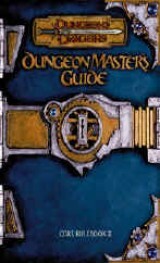 Hallelujah, the Dungeon Master\'s Guide (DMG) is here. The DMG is probably the single most important book in a Dungeon Master\'s (DM) library. It has rules for every situation and encounter that the game designers could think of, and thus provides an invaluable reference for a DM. For those of you who are unfamiliar with D&D and think that the DMG is just a large rulebook, you\'re probably right. It does have many rules governing combat and adventures, but this DMG is more than that; to me, it\'s a work of art and a wonderful piece of literature. When I first read this book I was amazed by how well-written it is. It not only covers all the information that a DM should need in the course of a game, but it covers it with a dash of humor thrown in. Throughout the book are examples to help a DM see how all the rules fit together and interact, and it also gives tips on how to run a game for beginner and expert DMs alike. The problem I have with this book is how to properly review it. I suppose the best way is to cover the most important chapters, discussing each in turn. So I\'ll cover chapters 1 through 6: 1) Dungeon Mastering, 2) Characters, 3) Running the game, 4) Adventures, 5) Campaigns, and 6) World Building. The last portions of the book are experience awards and magic items. These last portions are well written, but very dry and not very different from the Second Edition DMG. It takes time and experience to become a good Dungeon Master, and the Third Edition DMG provides a good starting point for developing DMs. In fact, the first chapter is called \"Dungeon Mastering,\" and is essentially a basic overview of what it is to be a DM. DMing isn\'t just sitting behind a screen, throwing monster after monster at the PC\'s, although I\'ve been in games where it felt like the DM was doing just that. Being a DM means that you have to be an arbitrator, a judge, a storyteller, a writer, and a teacher. Trying to do all of these things can seem overwhelming to novice, so the first chapter gives DMs guidelines on how to run an exciting and fun game for both the PCs and the DM. This section gives excellent descriptions on styles of game play, how to arbitrate rule disputes, how to keep a game balanced, and how to run a game session. In addition to all this, it provides a \'Handy DM Scratch Paper Tricks\' section which gives DMs tips on how to keep a game session flowing along and exciting. The most important thing to any player is their character. The DM tends to have little say over how a character will act or how it will interact with others, but the DM does have a significant say about the alternatives that a character has when advancing or creating a character. All of these options and many more are listed in chapter two, which is titled (appropriately enough) \"Characters.\" In this chapter are rules on how to develop different sub-races of the standard races found in the Player\'s Handbook. I mean, let\'s face it, the world wouldn\'t be the same without Drow to stir things up. The guide also provides rules on how to include non-standard races such as Centaurs, Ogres, Unicorns, and Giants as possible races in your campaign, and even gives all the rules needed to create completely new races. Races are only a portion, and a small one at that, of a character\'s profile. As a DM is developing a world they often develop groups and organizations within their world such as the Harpers in the Forgotten Realms campaign setting. These groups are often comprised of individuals of different races and backgrounds. Third Edition provides a new type of character class to cover those that belong to such groups. These are called Prestige Classes. A prestige class is simply a class that has requirements that need to be met before character can join it, meaning a character must be higher than first level (often fifth or sixth level) before he can become part of this class. Several fully-developed prestige classes are provided as examples of possible classes for your players, and possible classes for your villains. These classes include the Assassin, Loremaster, and Dwarven Defender, and harken back to the days of first edition, when it took work to become a bard and you ended up very powerful because of it. Creating and advancing characters is still just a small portion of what goes on in a game. At some point the characters will actually go out and interact with the game world. When this happens the DM has to run the game. Chapter three has rules for everything from combat situations to weather dangers. This section is of special importance since combat usually takes up a significant portion of a game, so a DM must know most of the general rules that apply to combat and be familiar enough with the rest to find those rules quickly. In the Guide, the rules for combat are described in detail with examples to help a DM understand how these rules work. Also in this section, the effects of monster and NPC abilities (such as Breath Weapons and Regeneration) are described. A DM should understand enough about these abilities so he can use them effectively against his players. That doesn\'t mean that he has to memorize all the specifics of each ability (since this would be very difficult and take considerable time) but that he should have enough of an understanding to comprehend what is happening when these abilities are used. The write-ups provided in chapter two give excellent descriptions for what happens with each ability and well-described game mechanics for each. This information is needed to develop and run good adventures. Although it is possible to purchase a pre-made adventure module most DMs will at some point want to develop their own adventures. All the rules that a DM needs to do this are found in chapter four. This chapter is given over exclusively to developing adventures. It has the rules for the design of the dungeon, how to get the adventure started, how challenging to make the adventure, and how to pick out what creatures the PCs might encounter. Designing the adventure is one of the ways that a DM gets to really shine. Good adventures are well-remembered and will garner praise from peers; on the other hand, bad adventures can end a promising DMs career in a hurry. Drawing a dungeon and picking out traps are detailed in this chapter, but they aren\'t all that critical since most people can do that with a bit of common sense and a ruler. The most difficult things about designing a good adventure are more abstract, such as determining what structure should the adventure have and figuring out how to motivate the players to go through the adventure. This section has excellent descriptions of what to and not to do for all of these parts of the adventure. For any beginning DM (and a few experienced DMs I know) this section is a must read. It will help to develop fun and interesting adventures for all concerned. It\'s fairly common to have one adventuring group going through a series of adventures together. That\'s what a campaign essentially is-a series of adventures in which the characters have a chance to develop and grow over a long period of time. This means that a DM has to deal with what the characters do between adventures. Where do the adventurers stay? Who do the adventurers spend the most time with? Are there recurring villains? All of these are questions that a DM must answer to run a good campaign. Chapter five has good suggestions for how to answer these questions. It provides information that is essential, but tedious to decide on your own. For a beginning DM this section will help tremendously to create a fun and dynamic campaign. There is an essential element needed to run a campaign or even an adventure that hasn\'t been discussed yet. This essential element is a world to set the campaign or adventure in. There are several worlds, called campaign settings, that have been published for Second Edition and that will be published for Third Edition. These are probably the easiest for new DMs, but the rules for world building are presented in chapter six of the DMG. This chapter discuses all the aspects of a well-rounded world. It discuses with great detail all the aspects of a D&D world. It covers from politics to economics, war to religion, and geography to magic. All of these things go into world building and have a profound effect on how fun the game is. The development of a world is difficult and can be time consuming, but it can also be very satisfying. There are no easy ways to make a well-developed world, but the tips and suggestions in the DMG do make it easier. This book is a well-written work of art. It provides a huge amount of information to help run a good game. Moreover, it presents it in a plain, humorous style that is appealing. It provides rules and guidelines for an endless amount of creative output. It provides in-depth information on subjects from the character to the world itself. It shows how to run a game and how to be a DM. Finally, it gives examples of almost everything it does so as to stimulate the DMs creativity and aid in his understanding. I have to say that this book is a MUST HAVE for any gamer interested in running, or for that matter even playing, Third Edition AD&D.